Fun Folk & Action Packed! Miss Anna's Music Class is a sing-along, dance-along, play-along powerhouse for younger children. Miss Anna's Music Class: a pre-primer for little folkies is a sing-along, dance-along, play-along album for younger children. Anna sings mostly traditional finger-plays and play-party songs, in a pleasant acoustic folk style. 15 children sing-along on "She'll Be Comin Around the Mountain". The Jazzy guitar playing of John Devens is featured on the Louis Armstrong classic, "What A Wonderful World". A capella songs and verses are mixed in with songs accompanied by guitar and banjo. 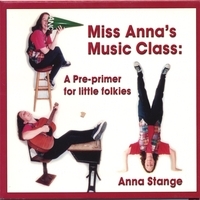 This CD is an audio version of the popular music classes Anna Stange offers for very young children and their parents. Lyrics for all songs are included on the CD jacket. Russian lyrics for "May There Always Be Sunshine", and German words for "Head, Shoulders, Knees and Toes" are also included. Folksinger ANNA STANGE offers her upbeat programs featuring traditional folk songs to audiences all across the United States. From ballads to singalongs, Anna's shows feature old favorites from the American folk traditiona and newer songs she's gathered along her travels. Anna has been making music with and for children and adults since her daughter, then two, brought her to "Show and Share". Anna teaches guitar, piano, dulcimer, ukelele and children's music at World Folk Music Company in Chicago. She is a former elementary school teacher who presents educational and fun musical programs to students at schools and libraries aroudn the country. Anna grew up in Michigan's Upper Peninsula where she played piano and trumpet. Anna took up the guitar after her trumpet was stolen in a burglary in 1985. She learned folk music by hanging out at Chicago's Old Town School of Folk Music, and later from members of the Broward (Florida) Folk Club. She picks up new songs from people she meets on her travels, recordings, and by making up new words to old songs. "Miss Anna's Music Class is a gigantic hit. Meghan my 3 year old has labeled it "awesome"! It is now the only tape listened to in our car. For Meghan it has replaced Barney song tape, Winnie the Pooh and various other musicians, which in itself is the highest recommendation Meghan could give! Thanks!" "It's wonderful! The pictures of you are so fun. I love the way the CD is packaged. Mmmm, what else. Oh yes, the MUSIC! Simple, easy songs, done simply. I like it, it's just what the little ones need. You're great!" wow! my sister loves Anna Stange!!! GOOD MORNING is here FAVORITE! THNK GOD FOR ANNA!!!!!!!!!!!!!!!!!! A must for any child's music collection! This CD is exactly what parents need to get them singing with their children! You'll be reminded of old favorites from your childhood and learn a few new ones. You and your children will be unable to listen passively. You'll just have to get up and move and if you're in the car, you'll have to enviously watch your kids move in their seats while you drive. Thanks Anna! The song-stories in this CD are excellent. Children's attention and enthusiasm are evident while listing to the songs. The familiar snappy songs gets us all dancing. Everyday Max asks to listen to his Anna CD. The songs are familiar and snappy and it gets all of us up and dancing! The CD cover is like a book and a lot of fun to look at. I'm really glad I have this album, along with several others from Miss Anna! This one truly has great folk songs for youngsters. Anna's sweet and gentle voice makes it easy for anyone to sing along. And that's what folk songs are for, no matter where on the age time-line the songs fit! Had many songs I had never heard. Good collection of songs. I am 60 years old and had never heard several of these. This is for my 11 year old granddaughter's Christmas. I mad her a quilt of the little old woman who swallowed a fly, so I HAD to have this CD! Got it quick, love it and use it every day! I came upon this website by accident and thought I might like this CD. I ordered it and received it so quick! It turns out that it is exactly what I am looking for. I teach PK and the children needed new songs to sing and dance to. Thank you very much!